You can buy your VIP ticket online. 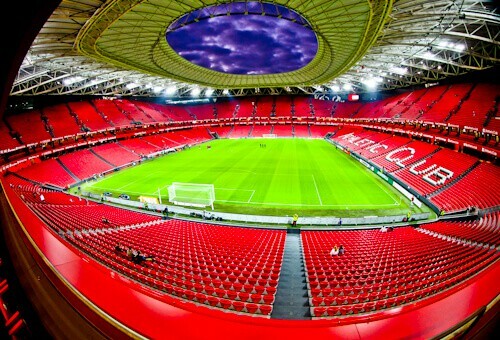 The new state of the art San Mamés Stadium is located in the center of Bilbao. It has been a major part of the city for over 100 years. When the stadium was rebuilt, it kept it’s place in the center. This meant that all the historic businesses surrounding the stadium remained after the rebuilding. If you’re staying in the center of Bilbao you can easily walk to the stadium. 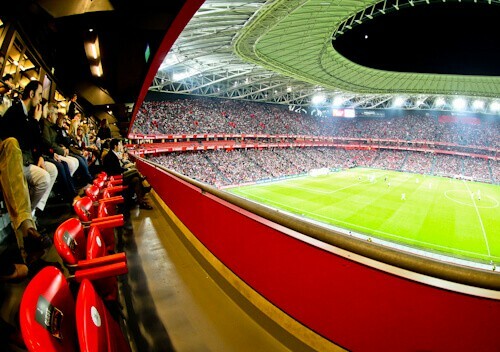 If you’re staying a little outside the city the stadium is served by San Mamés metro station. You may enter the stadium 90 minutes before kick off. I recommend doing this as you’ll have more time to enjoy the bars and pintxos. You’re welcome to walk around the VIP seats and view the stadium from different vantage points. Three sides of the middle tier are VIP seats. The remaining side of the middle tier is reserved for the president. These are the best seats in the house, you’re sharing with the president of the club. Around the VIP area you’ll find kiosks from local Basque companies. The good news is the Basque region has some of the worlds best wine. 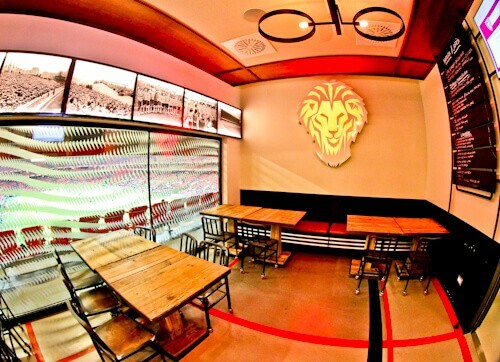 Wine lovers can enjoy a little wine tasting before and after the match. 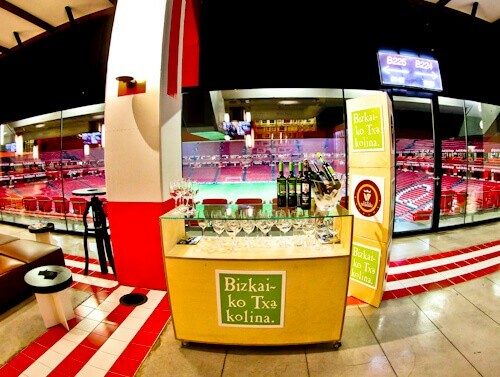 If you are visiting the stadium as a couple, the lady will probably enjoy the wine tasting more than the football! As well as wine you’ll find numerous kiosks with local offerings. Before and after kick off there will be waiters offering drinks and pintxos. Pintxos are the basque regions version of tapas. I have tried tapas all over Spain and I must confess, pintxos are much better than tapas. Service at the bar is very quick and a waiter will probably bring you another drink before you know you even need to go to the bar. All the waiters speak English and are interested in where you are coming from to watch the match. The San Mamés stadium has an electric atmosphere. The fans really believe in their team. They’ve beaten Barcelona before so the crowd are straight to work as the 12th man of Athletic Bilbao. No alcohol is served from kick off until the final whistle. During half time a lot of spectators were ordering beer without alcohol. Of course you’ll be hungry at half time and there will be plenty of pintxos on offer. 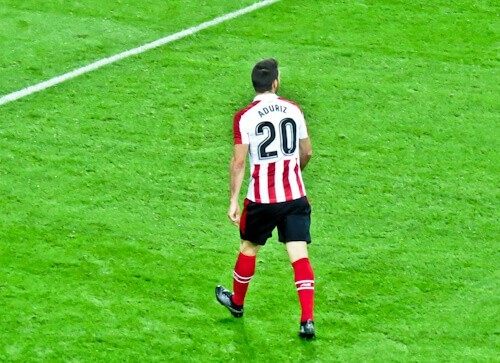 Athletic Bilbao is a unique team. What makes it unique is that they only field players who were born in the Basque region of Spain. Since Athletic Bilbao was formed in 1898 they have always been in Spain’s La Liga . That stat is impressive on its own. Some of Spains most famous teams have been relegated from La Liga at least once. Teams such as Athletico Madrid, Villareal, Sevilla and Valencia have all been relegated. They’ve been relegated whilst having the freedom to bring in players from anywhere in the world. Imagine if Liverpool could only field players from Merseyside. Imagine if the Manchester teams could only sign players from Greater Manchester. It’s hard to believe they would be as successful as Athletic Bilbao have been. The best players in the world play in Spain. If you take a VIP seat when Barcelona or Real Madrid are playing then you’re in for a treat. Famous players I was able to see were, Messi, Suarez and Pique. If Barcelona were to only field players from Catalonia would they be as successful as Athletic Bilbao? I think not. 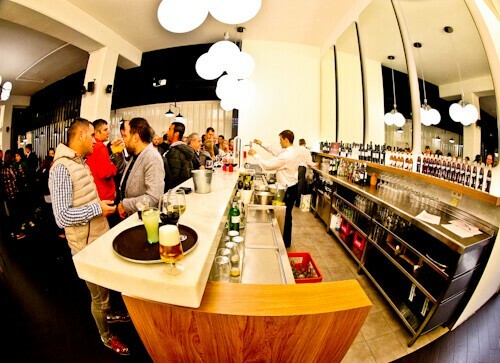 When the game is finished you are welcome to enjoy drinks and pintxos after the match. There are screens around the stadium so you can enjoy your last drinks whilst watching the post match analysis. 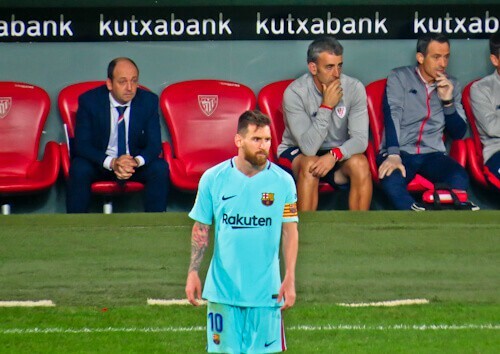 The game I watched finished Athletic Bilbao 0-2 Barcelona. I thought this was not a bad result, often teams lose to Barcelona by a greater margin. Visiting when it’s not match day? 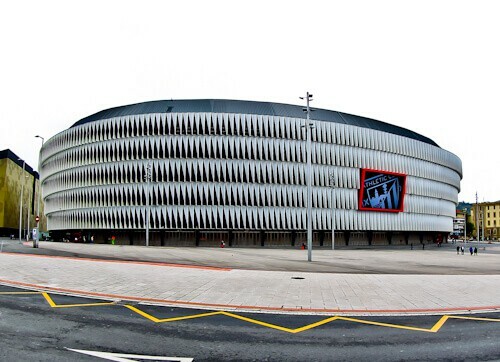 If you’re visiting Bilbao and it’s not match day it’s still possible to visit the stadium. 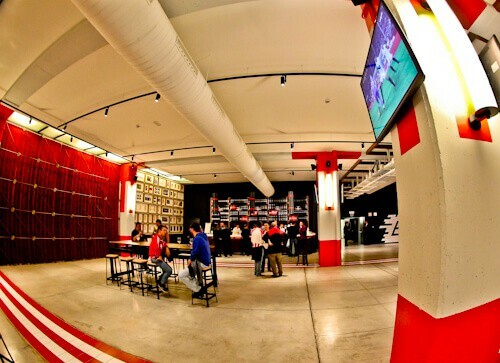 The most convenient way to see the stadium would be to visit the bar. From the bar you can enjoy the view of the stadium whilst enjoying a drink. Something unique about this bar is that the old pitch is marked on the floor. When the stadium was rebuilt it was moved slightly so they could continuing playing during the move. The old corner of the pitch used to be where the bar is now. If you want a more in depth visit to the stadium you can take stadium tour. On a stadium tour you can visit the team dressing rooms, press rooms and pitch side. It’s arguably the best stadium in the world so if you do a stadium tour anywhere, it should be here. 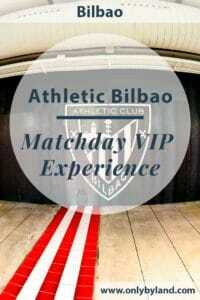 Enjoy the match and the Bilbao experience. It’s not only the team that is from Bilbao but the local wines, pintxos and other local products. You could not visit a football stadium anywhere in the world that would give you a better experience of the city it’s representing. You may buy your VIP ticket online. I had no idea that Bilbao stadium was so impressive and state of the art. You saw the match I would most like to see there, against Barcelona! It’s impressive that they only field players from the Basque region, yet have had so much success! You’re very right about the ladies enjoying the wine more than the football, that would be me! However, I like the energy of watching a live match, so I’m sure I’d enjoy it too. I love pinxtos, and can easily eat more than 5! Great tip on arriving earlier too; more time to eat and drink before the match starts! Great you watched match and that Messi was playing in, he is a super star. Post match analysis with favorite drinks would be great for football lover. I’ve never heard of Bilbao but their a 5 star stadium and VIP facilities are impressive. What an exciting and luxurious way to watch a football match! Seems like a top notch stadium with unique Basque culture- love the endless pinxtos! This is such a cool experience to have if you’re in Bilbao! Their love for football is so evident and is a huge part of the culture. Hence, it will be a fun experience to immerse into that, regardless if you’re a football fan or not. This is brilliant and if I were to go and watch a match, I would love for it to be a VIP experience no doubt. The stadium is really swanky and you’ve really captured the pre and post games scenes quite well. I have never been to Bilbao but they have a fair every year or two for the products I deal in, so maybe now would be a good time to attend that. Watching the match from VIP seating is just awesome! My guy has done once at Emirates Stadium for an Arsenal match. This would be perfect for me, as I’m the wine lover among us 2, esp Spanish Wines are indeed awesome. Good to know that they speak English as well. What a great way to enjoy football match! I definitely think that it’s amazing to watch from the VIP area. I went to stadium to watch football before, but just in a normal area. Would love to try this one day. It must make it so much easier being able to relax after the game with a drink instead of the normal rush to leave! I’m not a football fan, but I would surely not let go off an oppurtunity like this. The San Mames stadium is fabulous, watching a game here will indeed be an amazing experience. The VIP area, food and drink look extraordinary, so lucky you could watch Messi play.